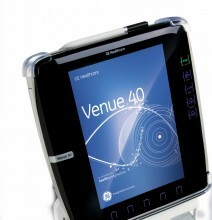 The Venue 40 offers point-of-care ultrasound technology that’s surprisingly easy. With intuitive, pre-configured applications and a touch interface, it’s designed for easy use in anesthesia, musculoskeletal, interventional, emergency and critical care and vascular access environments. There are no buttons, no keyboard, no knobs to complicate the process or slow you down. Just gel and go. Needle recognition feature helps provide accurate vision in three key areas—needle, anatomy and motion to help accurately reveal the structure of a needle within anatomy, without distortion. Precisely visualize your target and surrounding anatomy – all with defined edges and detail. Power Doppler Imaging (PDI) highlights vascular sensitivity for fine vascularity and low flow. PDI quantification for diagnosis and monitoring. * Power Doppler Imaging (PDI) sensitivity helps verify the presence of blood flow to help detect small vessels, inflammation and disease states in both adult and pediatric patients. * Color and PDI quantification helps evaluation of the amount of blood flow within a specific area to assist with diagnosis and monitoring. Work faster with intuitive, pre-configured application settings. Touch interface allows easy operation. Quick boot-up time helps you respond fast when time is critical. Stylus allows for quick patient data entry. Adjustable height and screen tilt offers enhanced comfort and helps efficiency. Single-surface, splash-resistant screen has no seams, buttons, keyboard or a monitor frame to trap contaminants. Flush transducer connection helps to reduce the places germs can hide. The screen withstands medical disinfectants and everyday wear and tear. Perform superficial and deep imaging – all on one system. Choose from a variety of transducers (linear, convex and phased array). * 12L-SC: Linear array for peripheral vascular, small parts, superficial musculoskeletal, nerve blocks, thoracic/pleural, and needle guidance procedures. * 4C-SC: Curved array for abdominal and deeper imaging. * 3S-SC: Phased array for cardiac, abdominal and pleural imaging. * L8-18i-SC: High-resolution, small linear array for superficial and pediatric imaging. * E8CS-SC: Microconvex array for transvaginal exams. Design enhances ease of use, ergonomics and patient comfort. Lightweight transducer cable minimizes strain, to help facilitate transducer placement. The Venue 40 wheels into tight spaces such as bedside or trauma bay. Universal docking system enables mounting in a cart or a table dock without tools for easy transfer while on battery. With a quick boot up time, it can be ready by the time you put on your gloves. Optional storage tray keeps your supplies within reach for convenience. Easily record, archive, recall, transfer files or print. Flexible archiving so you never have to leave your images in the machine. Send images to your destination – PACS or EMR – even on battery and unplugged. Use the DVI port to display your screen on an external monitor. Get easy archiving with multiple file formats: JPEG and MP4 (one-minute loop capability). Save images to SD Card or USB drive for easy archiving. Transfer images on the spot with wired or wireless (optional) network connection. Store images and cine loops to a shared folder across the network for attachment to EMR. Optional DICOM for image storage to PACS and worklist. Optional black & white printer to print on the go. Click the button below to add the GE Venue 40 Portable Multipurpose Ultrasound to your wish list.